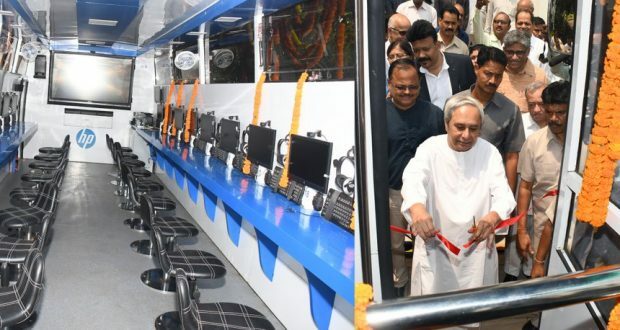 Bhubaneswar:31/3/18; Odisha government today launched a special vehicle to impart training to the school students and rural populace and enable them to have access to the digital world. 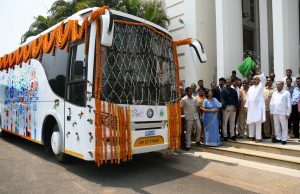 Chief Minister Naveen Patnaik flagged off the special ‘Digital Literacy Vehicle’ that would help enhance digital literacy, especially in the tribal-dominated districts. “Digital Literacy Vehicle is a welcome initiative. I’m given to understand that it’ll impart training to more than 7,500 individuals in the next five years and will help bridge the digital divide,” Chief Minister Naveen Patnaik said. Informing media on the programme, Center for Youth and Social Development (CYSD) convener Jagadananda said, “On behalf of Hewlett-Packard (HP WORLD) company, computer literacy or knowhow of digital world campaign has been launched so that the general mass could have an access to it. In this facility, training on computer operation will be imparted, also training will be imparted to know about their lifestyle and livelihood.”“This ‘Jatra’ (campaign) will be first launched from Thakurmunda block in tribal-dominated Mayurbhanj district. This special programme will begin in 20 educational institutions of Thakurmunda block. Plan India, CYSD and Entrepreneurship Development Institute of India have collaborated with HP in this joint venture. After Mayurbhanj, the programme will be in tribal-dominated Keonjhar district. Phase-wise this computer literacy van will venture into all the tribal-dominated districts of our State,” he added.